Based on the Sejong National Corpora, the largest written and spoken corpora in Korean comprised of 10 million words collected from different genres, the Dictionary provides the user with detailed information for each of the entries, including illustrative examples and English translations. 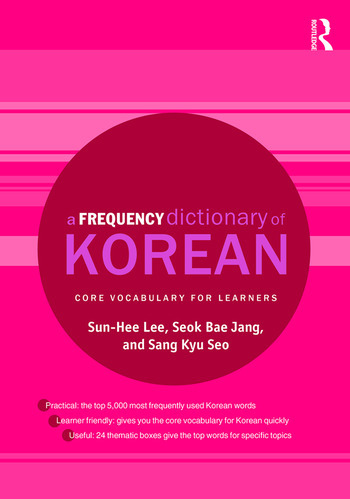 With entries arranged both by frequency and alphabetically, A Frequency Dictionary of Korean enables students of all levels to get the most out of their study of vocabulary in an engaging and efficient way. Frequency Index. Alphabetical Index. Part of Speech Index. Sun-Hee Lee is an associate professor in the Department of East Asian Languages and Cultures at Wellesley College, USA. Seok Bae Jang is a full-time instructor in the Department of East Asian Languages and Cultures at Wellesley College, USA. Sang Kyu Seo is a Professor in the Department of Korean Language and Literature at Yonsei University, Korea.